Despite measuring just 693 x 208 mm, the iRig Keys I/O somehow manages to squeeze in a full-size 49-note keyboard. IK Multimedia are probably best known to music tech veterans as a software developer, with well-established products like T-Racks, AmpliTube and SampleTank. But in recent years they’ve made a name for themselves with the growing ‘iRig’ range of interfaces, controllers and accessories that have penetrated into mainstream retail outlets. They have a knack for filling gaps in the market with products that solve problems for pros and hobbyists alike. The iRig I/O 49 Pro is a light and portable, yet full-size, controller keyboard made for both iOS devices and computers. It is also an audio interface providing stereo output and headphone monitoring, plus a line, mic or instrument input. IK appear to have aimed for a sweet centre spot when laying out the design parameters of the iRig I/O Keys. It’s about as compact as a controller with full-size, full-travel keys could get without ditching other controls altogether. The glossy panel, touch sliders and cool blue lights give it a pleasing futuristic appearance. It has a light, plastic shell but feels reasonably rugged. A big plus is the use of touch-sensitive, endless encoders rather than basic pots, although the feel of these is the one thing that lets the side down a bit: they’re wobbly and not that easy to grip. The keyboard will run from USB power when connected to a computer, giving you a nice one-cable setup. You can also get power from four AA batteries, which is a requirement when running with an iPhone or iPad, and there’s a switch to choose this option if you want to help save your laptop batteries. A PSU is available as an optional extra (I got one in the box), which allows you to charge a connected iOS device. Although there’s battery power there’s no MIDI output outside of USB, so the iRig Keys I/O isn’t suitable as a stand-alone master keyboard for hardware. A MIDI port would also have been nice as a MIDI interface for a computer or iOS device: it would have made the iRig Keys I/O a true one-stop shop for simple studio connectivity. After loading up the AAs, I began a perplexing and ultimately fruitless search for the USB connection to hook up to my Mac. IK have decided to ditch the regular USB Type-B port for a small DIN connector combined with adaptor cables. This is familiar from other iRig devices such as the Pro I/O and iRig Pads. On the iOS side, this has some benefit as it allows you to just use the dedicated Lightning connector provided without the Apple Camera Connection Kit that most iOS compatible devices rely on. Other than that though it’s a bit of a drag. The provided cables are too short, especially the USB one. And sooner or later you’re going to lose or break one and then you’re out of action until you buy a €$30 replacement. The iRig Keys is class compliant as both a MIDI controller and audio interface and requires no setup on either Macs or iOS devices. On Windows you’ll need ASIO4All for the audio interface functionality. The only hardware-related install is a Logic/GarageBand controller plug-in. There’s also an instrument bundle that runs on both desktop and iOS platforms comprising the full version of SampleTank 3, the orchestral SampleTank-powered Miroslav Philharmonik 2 CE, and Syntronik Pro-V. Additionally, on computers you get the T-Racks 4 Deluxe mix and mastering suite plug-in. For much of the time that I had the iRig I used it as a generic keyboard controller and interface on my Mac, working in Reason, Pro Tools and Live, with a little bit of Logic to test the integration. The keyboard feels positive and ‘non-budget’ and the pads are robust with decent sensitivity and range. Pitch and Mod controls are on touch sliders, which I like, and the other buttons are under similarly damage/liquid-resistant flat surface covers. Alongside the sliders you have octave shifters, Program Change triggers, then three buttons that double as transport controls for connected software and internal edit controls for the keyboard. Lastly, there’s an Alt button, which toggles the other controls between their main and secondary functions. The iRig Keys I/O comes with a handy iPad stand. iOS is treated as an equal by the iRig Keys I/O. As well as the direct Lightning connection you get a special iPad stand in the box. This simple but effective plastic bracket presents your tablet at the right height and angle behind the keyboard, and the foot slides underneath to hold everything in place. As well as the included apps the keyboard worked nicely with several iOS synths and GarageBand. I also set up a map in my favourite iPad DAW, Beatmaker 3, which worked fine, although I could have done with some more controls and pads to really make this effective. With a relatively modest array of controls, the iRig relies on preset layers to broaden the scope of its MIDI functionality. There are four factory maps, and 99 available user pages. Each preset can store completely different MIDI functions for nearly every button, knob, slider and pad on the surface. All presets can be recalled in a three-step process via the data wheel, but there’s also a fast recall option which brings up the first eight user maps on the drum pads. Preset 1 is set up to work with the IK Multimedia software instruments, giving hands-on control of patch browsing and macros. It puts only white notes on the pads, which is a bit of a pain for playing most generic drum instruments though. Preset 2 is aimed at Logic. Preset 3 is a general chromatic map, which was where I spent the majority of my time, and, finally, preset 4 replaces the drum pad notes with program changes. The Alt key accesses a second bank of knobs, but not pads, which is a shame given that most software drum instruments present 16 pads. The Logic preset provides a certain amount of intelligent mapping with Apple’s DAWs, but for other apps you’ll need to map controls yourself, or use your software’s learn functionality. With some patience you can edit your own user presets for fast access to more control pages from the pads. Unlike the iRig Pads there’s no software editor, so you’ll need to follow the manual to navigate the hardware editing process via the basic three-character display. You’re free to assign most flavours of MIDI message to any control, and there’s a particularly clever option to assign a message to be sent on touch for the knobs. The knobs can send both absolute and relative control data. The iRig Keys I/O’s back panel features a power source selector switch, an input for the optional DC power supply, a DIN port for connecting to your device via an included adapter, a 3.5mm headphone socket, stereo outputs on quarter-inch jacks, a gain control for the audio input, a combi XLR/jack audio input socket and an external pedal input. I read with some scepticism that the iRig Keys I/O is the only combined USB MIDI keyboard and audio interface, but after some hunting around I concluded this to be true. There was a small Edirol keyboard with this combo that I reviewed a few years back, and Line 6’s Tone KB37 had audio on board, but neither are available any more. As I said, IK are good at sniffing out these gaps. 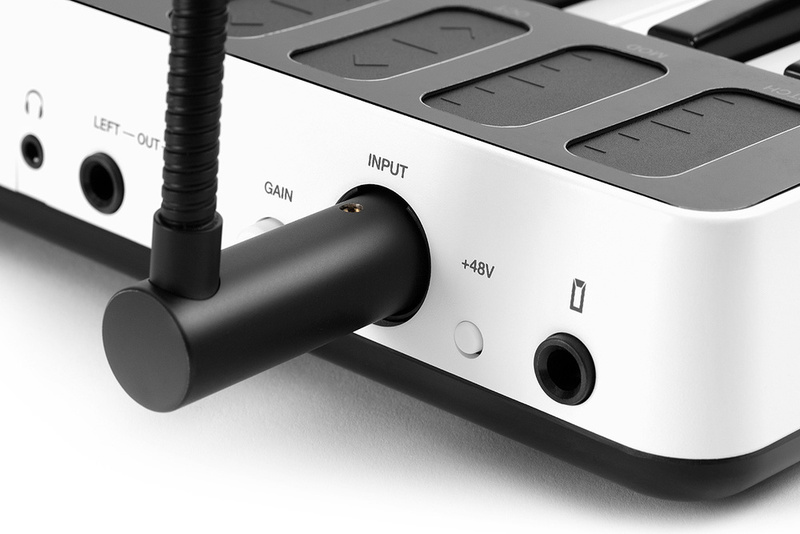 The iRig Keys I/O features a 1-in, 2-out audio interface (up to 96k, 24-bit), with the output channels shared by a pair of quarter-inch balanced jacks and a stereo mini-jack headphone port. Awkward reach-arounds have been avoided by placing the level control front and centre on the panel as a toggled function of the main data wheel. The optional gooseneck microphone’s L-shaped connector is a nice touch. The single input is a combined XLR and quarter-inch connector with a preamp that caters for all-comers: guitars, mics or line-level sources. Switchable 48V phantom power is provided, even when running from batteries. This time, gain control is on a small pot at the back, but this isn’t much of an inconvenience as you don’t need to access it often. I tested with a good-quality condenser mic and sound quality was perfectly adequate — just a touch of noise — with enough gain available for what I needed. There’s no provision for direct monitoring, so you’ll need to get that buffer right down. IK Multimedia are also selling a gooseneck mic for £$69.99 that you can plant directly into the back of the keyboard. Some of my conclusions about the iRig Keys I/O echo my thoughts about the iRig Pads, including my gripe about using proprietary cables. Both are highly configurable, with multiple user layers. Multiple encoder modes and the ability to send messages on touch show a degree of sophistication that pros can dig into. But both controllers lack a certain amount of instant gratification with software outside of the IK family. Few users program their MIDI controllers these days — they expect intelligent functionality using custom codecs and templates purpose built for their DAW. The iRig only offers this with Logic/GarageBand, so perhaps IK Multimedia are banking on a large percentage of their non-pro users using those apps. In any case, IK have made an attractive controller keyboard that’s portable yet full-size and supports both iOS and desktop as equals. It is also currently unique in offering USB audio I/O. If this ticks all your boxes you should definitely check it out. There are many other MIDI keyboard controllers with comparable control sets, and for the price you could get quite a bit more from the likes of M-Audio, Akai or Nektar. However, there are no alternatives with on-board audio I/O or direct Lightning support as far as I know, and the iRig Keys I/O is unusually compact for a full-size controller keyboard. 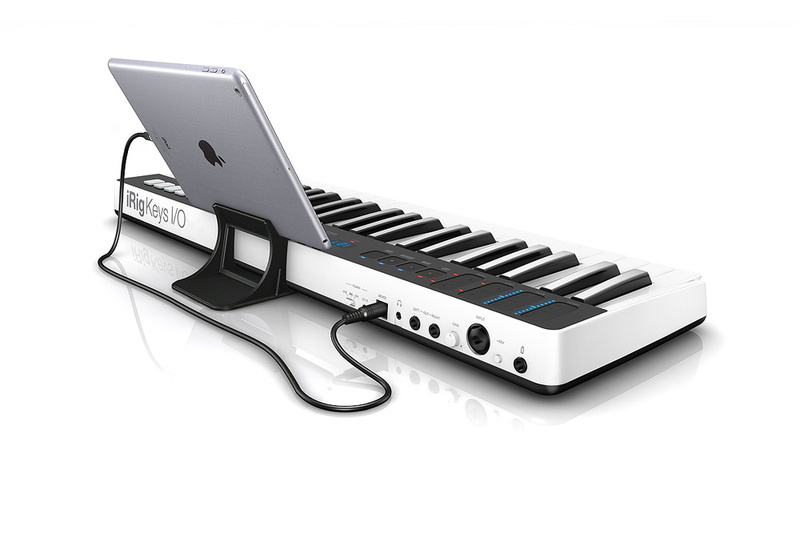 All-in-one keyboard and audio interface. Phantom power and high impedance input. Configurable with up to 99 user pages. Only Logic has specific control support. IK Multimedia’s iRig Keys I/O is an attractive, compact master keyboard and audio interface providing a one-cable solution for simple computer- or iPad-based music setups.